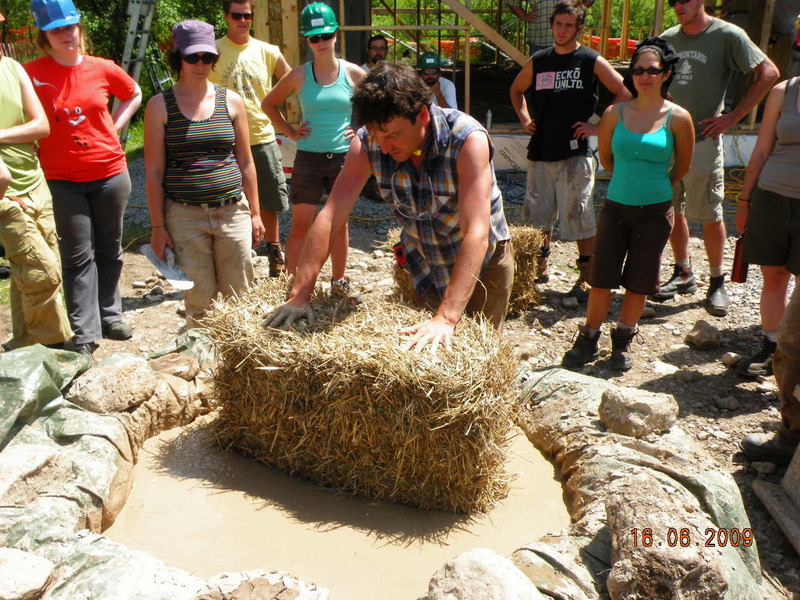 Are you interested in becoming a straw bale builder? The new Straw Bale Wall Installer and Plasterer Apprenticeship Program is a great way to get your career as a straw bale builder underway! The apprenticeship has been developed by the professional members of the Ontario Natural Building Coalition www.naturalbuildingcoalition.ca to create the type of training that will result in real-world skills and understanding to help apprentices on the path to becoming proficient practitioners. The Apprenticeship Program is being managed by The Endeavour Centre (www.endeavourcentre.org), a not-for-profit sustainable building school in Peterborough, Ontario. Endeavour will oversee registration and logistics for the apprenticeship and offer the classroom portion of the program. 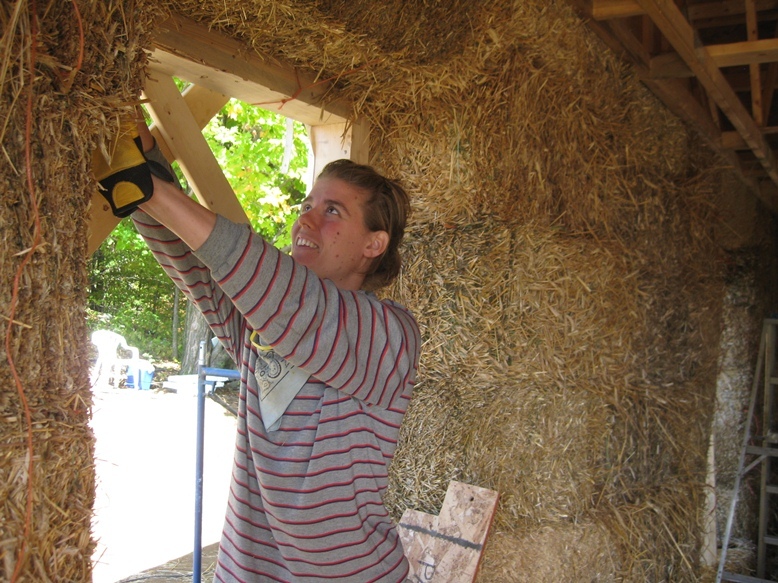 Based on current apprenticeship models for trades like carpentry and timber framing, the straw bale apprenticeship sees participants work on-the-job with qualified professionals. Each apprentice has a training manual that outlines a range of skill sets and experiences required to complete the apprenticeship. The trainer/employer signs off on each module as the apprentice completes it, and when all modules are complete and the classroom session and examination are passed the apprentice receives a certificate from the ONBC endorsing her/him as a qualified Straw Bale Wall Installer and Plasterer. Each apprentice is responsible for finding and making arrangements with qualified trainers. Many of the builders listed on the ONBC professional membership directory (url) are qualified trainers, and the guidelines for acceptance as a qualified trainer are included in the manual. An apprentice may work with multiple trainers over the course of completing the apprenticeship. Trainers do not need to be based in Ontario, as long as they meet the requirements of the program. This allows Ontarians to work elsewhere in the world and receive credit for their training, and also allows those from outside Ontario to participate in the apprenticeship and receive the training certificate. It is hoped that this will continue the tradition of knowledge sharing around the world that has been so important to the development of straw bale building. Apprenticeship hours can be applied retroactively in many cases, as long as the trainer meets the qualifications and is willing to sign off on the appropriate hours. For those who have been working in the field, this option can help to fast track the apprenticeship training period. The classroom component of the training covers a variety of units on straw bale design, theory, structure and building science and regulatory issues. The Endeavour Centre will offer the first classroom session on January 14-18, 2013, and sessions will be held twice a year. A written examination delivered at the end of the classroom training is required to become an ONBC certified straw bale professional. The classroom training may be undertaken any time during the apprenticeship. Once certified, you will be able to present your qualifications to prospective clients and/or employers. Your successful completion of the apprenticeship and the endorsement of the ONBC will be valuable assets in your straw bale building career. The Apprenticeship Training Manual can be downloaded here. Apprenticeship registration and fees are managed by The Endeavour Centre. If you would like to be part of this exciting new program, you can register here.